The alarm was set for 6.30am this morning but a bad night's sleep meant I wouldn't be sleeping in anyway. Jess came into our bedroom at 6.28am to tell us it was school and time to get up. She was surprisingly excited. The other two were already up and dressed. 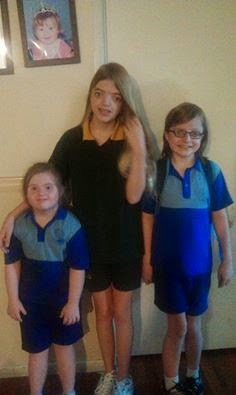 Melissa didn't need to be at school until 11.30am so it was just the youngest two who left the house at 8.30am, Nick was dropped off first - to his 2014 room but with a different teacher who was new to the school. Shyness took over as he stood in front of his first full-time male classroom teacher. A quick word with Mr G to let him know that Nick has a craniofacial syndrome and a shunt and is banned from contact sports due to his facial operations and a 'there should be information in his file but we will come and see you soon to tell you about him anyway' and we left Nick to settle himself into the front row. No need to overwhelm the teacher on the first day with all of Nick's history. I knew Nick would be fine. The teacher might not know Nick but the other kids did and he was well liked. It was time to drop off Jessica. We met with Jessica's teacher and the Special Ed. teachers last week so Jess knew where she was going and understood she was in a new classroom with a new teacher and she was now in Year Three. Miss L had told us that she had taught children with intellectual impairments and ASD and that was such a relief to hear. Teachers without experience in this area seem to get scared of the 'Down syndrome' diagnosis. She was not scared at all but very positive about having Jess in her class (Jess has some ASD behaviours). We went into the Year Three classroom, found her desk and Jess sat down, looking a bit unsure. Joe pointed out some children in the class she knew from Year Two. One said hello to her. A child in her row asked what her name was. Joe told him. I had a thought and decided to take her to the toilet to help avoid an accident at first break. Then it was time for a kiss and a hug and a good-bye. With a slightly worried heart I left the room. It was a funny feeling. An uneasiness, all due to the unknown. When you have a child with an intellectual impairment you don't know what they are thinking. Did that unsure look mean she was scared? Would she cope with the new environment? Would she cope with all the changes? Would she cope with the new teacher? Would the new teacher cope with her? Would children play with her? Would the new children accept her? Would the children understand what she was saying? Many questions ran through my mind. Questions I didn't have with my other two children. I wouldn't know the answers to these questions until 3pm or even for days. A couple of hours later it was time to drop off the teen at the high school for a half day. She was unusually quiet and appeared nervous. I hoped she would be fine. I was sure once she saw her besties she would settle. We wished her a good day and saw her disappear into the abyss. The day went too quickly. Ebay orders, lunch, a nap and it was time to see how their days had gone. Jess's teacher was the only one I wanted to see in person. How had my angel gone? Did I have any answers to those questions? Outside the classroom Jess had said the day was 'good'. Would the teacher agree? She did (big sigh of relief) with the only problem being that Jess kept getting her food and wanting to eat during lesson time. In the scheme of things I was happy to hear that that was the only difficulty. Jess should soon adjust. I expected chatter on the way home about the happenings of the day but there was nothing. I put on my cross-examiner's hat and tried to dig for information. I got the following responses from the two eldest: boring, boring only labelled books, don't know my teachers apart from my Prep teacher who went on camp with us last year, don't know what the teacher is like yet - it's only been a day. I was shocked by the lack of enthusiasm. Maybe it was first day letdown. There were no fireworks. Jess told me that she played with her friend from Year Two at playtime which made me happy. That answered another of my questions. So overall Day One appeared to be satisfactory. Maybe a C rating. We will see how Day Two, Three, Four ... go. Blog 77 - Welcome 2015! It is already the 5th of January, 2015. 2014 has come and gone. As I sit here at my laptop reflecting on the last year, I can confidently say that it was a year of change and a year of healing. I came into 2014 learning the news that I would no longer be able to teach. This has earlier been blogged about and it caused great confusion. I lost my identity. I had always taught - that was what I did. Being forced to stop work by my doctor, who had my mental and physical wellbeing at heart, was also hard to cope with. Looking back, he did the right thing but I couldn't see it at the time. I mourned what I had lost and had to adjust to the change - another challenge for me! The year consisted of many therapy sessions challenging my thought processes. It was a year where I pushed myself out of my comfort zone and did things I had never been brave enough to do before. I grew through these experiences. In my therapy sessions, as well as dealing with ways to help cope with my anxiety attacks, I also delved into the past. It was time, at the age of 46, to go back through my life. I had to deal with growing up with Crouzon syndrome, in a society that was not always accepting of my facial difference. As layer upon layer of my experiences, both good and bad, were peeled back, I could feel healing taking over my mind and heart. A few meetings with past influential people also occurred to coincide with this healing, which led to more healing. With that healing came a new found feeling of wholeness and confidence and an acceptance of who I am. I made the decision that no longer was I going to be embarrassed that I was born with a craniofacial syndrome. No more was I going to let it stop me from achieving my heart's desires. No more did I have to be shy because of my syndrome. No more would I be ashamed that I suffered from anxiety and depression. I have no idea what 2015 will bring but I know I am entering it as a new woman with hope and the belief that what I put my mind to I will achieve - as a wife, a mother, a writer, the Our Faces Support founder and as a friend.